Oppo will announce the R9s and R9s Plus smartphones next week, on October 19. The company has started teasing the duo in China, with TV commercials and promotional leaflets already being out in the wild. 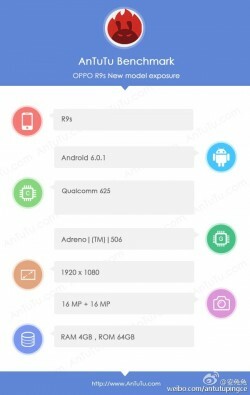 The R9s will come with a 16 MP rear camera powered by Sony's IMX398 sensor, supposedly a dual-pixel affair like the 12 MP snapper inside Samsung's 2016 flagships. The selfie cam will also have 16 MP resolution, though we assume a lesser sensor will be used here. Anyway, the R9s has been put through the paces of the AnTuTu benchmark ahead of its release, so its most important specs are now publicly available in the benchmark's online database. As seen in the picture to the left, the phone should have a 1080p touchscreen, 4GB of RAM, and 64GB of built-in storage. At the helm we find Qualcomm's Snapdragon 625 chipset, with the Adreno 506 GPU. The Android version installed is 6.0.1 Marshmallow. From past leaks we know the screen size will be 5.5" and the battery capacity will be 3,010 mAh, with support for Oppo's proprietary VOOC superfast charging. No i've seen and tried plenty of good cameras fir midrange smartphones and they are better in many ways than what Oppo had to offer in the R7 plus last year.